"In the Name of National Security" exposes the ways in which the films of Alfred Hitchcock, in conjunction with liberal intellectuals and political figures of the 1950s, fostered homophobia so as to politicize issues of gender in the United States. As Corber shows, throughout the 1950s a cast of mind known as the Cold War consensus prevailed in the United States. Promoted by Cold War liberals--that is, liberals who wanted to perserve the legacies of the New Deal but also wished to separate liberalism from a Communist-dominated cultural politics--this consensus was grounded in the perceived threat that Communists, lesbians, and homosexuals posed to national security. 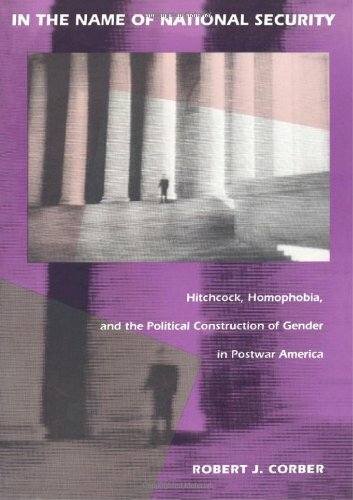 Through an analysis of the films of Alfred Hitchcock, combined with new research on the historical context in which these films were produced, Corber shows how Cold War liberals tried to contain the increasing heterogeneity of American society by linking questions of gender and sexual identity directly to issues of national security, a strategic move that the films of Hitchcock both legitimated and at times undermined. Drawing on psychoanalytic and Marxist theory, Corber looks at such films as "Rear Window, Strangers on a Train, " and "Psycho" to show how Hitchcock manipulated viewers' attachments and identifications to foster and reinforce the relationship between homophobia and national security issues. A revisionary account of Hitchcock's major works, "In the Name of National Security" is also of great interest for what it reveals about the construction of political "reality" in American history.